Meatloaf is one of my all time favorite dishes. Just how much do I love meatloaf? It was the main entree at our wedding buffet. I LOVE a good meatloaf! It’s also a fantastic bariatric friendly meal. A few tweaks to the classic versions to omit the starch such as oats or breadcrumbs, and this is easily a low-carb and high protein dish. 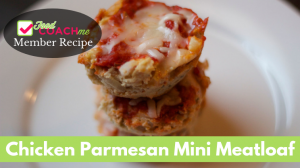 You can also make mini meatloaves which make a great bariatric size meal and they re-heat wonderfully for easy lunches or dinners later in the week. One of the best features of meatloaf? The possibilities are endless. The more I’ve made meatloaf in new ways, the more ideas that come with what to do next. It also becomes really easy to throw one together on a Sunday afternoon, which is when this recipe was created! Not unlike a soup, you can truly add a little of this or a little of that. 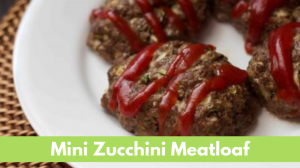 I’ve made meatloaf recipes anything from Italian flavor focused to Cajun to Santa Fe and more! Click this link for a list of my meatloaf recipes. 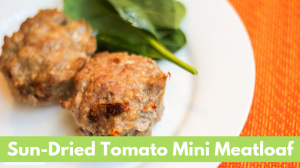 Below a few mini meatloaf recipes here on FoodCoachMe. For more information on what a portion size is for you, watch the video Best Meal Plan After Surgery. For the complete video series, sign up for my email list. An easy low carb meatloaf that fits the bariatric diet. 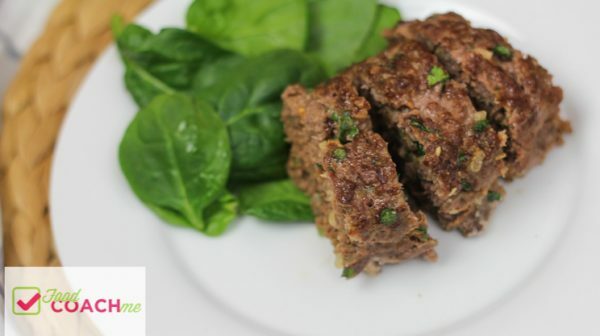 Uses classic flavors of onion and beef with added spinach for more nutrition benefit. In a medium mixing bowl add all ingredients. Combine well until fixture is well incorporated. Form meat into two smaller loaves and place in an 8x8 casserole dish. Bake for 40 to 45 minutes or until a meat thermometer reads 160F. Remove from oven and let cool slightly. Slice and serve. Can add a small amount of ketchup to your serving as desired, start with 2 tsp on the side and dip your fork in the ketchup, then the meatloaf, to get a small taste in each bite. This recipe makes 4 servings. Each serving of meatloaf is 3 ounces. Adjust according to your pouch. One serving (3 oz) provides an estimated 29 grams protein, 6 grams carbohydrate and 12 grams fat. Estimated due to variation in brands and ingredients used.